Can Solar Energy Be Stored? - Sinoyin Solars Co.,Ltd. You are here: Home » News » Technical » Can Solar Energy Be Stored? 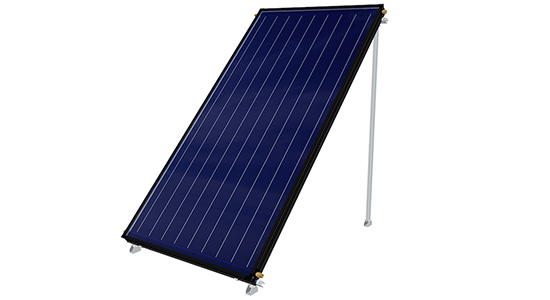 Flat plate solar collector is the most cost-effective and commonly used kind of solar thermal collector because it can be used to store solar energy for heating water for domestic usage. This material is used to generate lots of free hot water for the home because it can be constructed and operated easily. These flat plate collectors have the benefit of absorbing not only the energy coming from the sun directly but also the diffused solar energy that has been reflected around the panel itself. The flat plate solar hot water system can be used in various kinds of location or climate because the fuel which is used comes from the sun which is free of charge. Solar hot water panels use solar radiation to heat either water or some kind of heat transfer within the collector with the heated water held in the storage tank just like the conventional electricity heated hot water. In most of the domestic households, heating water is the biggest energy use, this consume a high volume of energy on daily basis. This amount of energy consumption can be significantly, and in most cases, totally reduced by using solar energy. Unlike the traditional form of water heating, solar hot water panels are not expensive, this implies that you will get your return on investment within a short period of time. There are several kinds of solar heating systems which can be chosen from. They are categorized based on the panel technology, panel location as well as heating fluid transfer method. Based on the kind of collector, it can either be closed-loop or open-loop, passive or active with each system having its own merit and demerit. The one which would be chosen would depend on your needs, budget as well as location. A "solar flat plate collector" typically consists of a large flat heat absorbing plate, usually a large sheet of copper or aluminium as they are both good conductors of heat, and which are painted or chemically etched black to absorb as much solar radiation as possible for maximum efficiency. This blackened heat absorbing surface has several parallel copper pipes or tubes called risers, running length ways across the plate which contains the heat transfer fluid, typically water. These copper pipes are bonded, soldered or brazed directly to the absorber plate to ensure maximum surface contact and heat transfer. Sunlight heats the absorbing surface which increases in temperature. As the plate gets hotter this heat is conducted through the risers and absorbed by the fluid flowing inside the copper pipes which is then used by the household. The pipes and absorber plate are enclosed in a lightweight insulated metallic or wooden box with a sheet of glazing material, either glass or plastic on the front to protect the enclosed absorber plate and create an insulating air space. This glazing material does not absorb the suns thermal energy to any significant extent and therefore most of the incoming radiation is received by the blackened absorber. The air gap between the plate and glazing material traps this heat preventing it from escaping back into the atmosphere. As the absorber plate warms up, it transfers heat to the fluid within the collector but it also loses heat to its surroundings. The heat stored are then used for heating water which is used for domestic use.